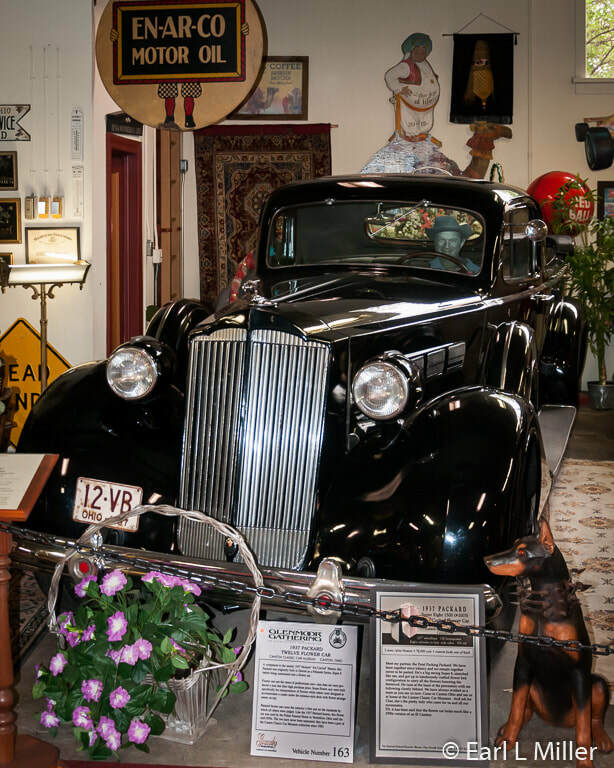 Although Marshall Belden Sr. owned several hundred cars, he chose to start a museum in 1978 with 30 automobiles. Marshall, who had an oil and gas company across the street, was a businessman and a preservationist. His wife, Florence, didn’t think people would come to just see old cars. She sought out garage sales and flea markets to find interesting items. Today these artifacts and many others cover the walls of the museum from floor to ceiling while 45 vehicles are exhibited. The museum’s building is also historic. George Monnet and Joseph Sacher built it in 1900 as home for their bicycle business and as garage rental space for cars. When it was constructed, It was Canton’s largest brick and concrete building. In 1912, Carl Fisher, founder of the Indianapolis Speedway, and Henry Bourne Joy, president of the Packard Motor Company, built the Lincoln Highway from New York City to San Francisco’s Lincoln Park. When the road passed through Canton in 1914, Monnet changed his business to a 24-hour service repair garage as his building was only six blocks from the highway. He also contracted with Ford to assemble cars on the structure’s second story. Parts were brought in, the cars built, and then they were ramped down to the dealership downstairs. It was the largest Ford dealership from 1914 to 1931. While Fords were the biggest sellers, Monnet also sold other models: Oaklands, Jefferys, Paiges, and Chandlers. The dealership was a showpiece with inlaid mosaic tile floors and hand crystal chandeliers. People came just to be curious even when they weren’t buying anything. After 1932, various businesses used the building for a variety of purposes. Ask Char to show you the videos on the building and the Lincoln Highway. 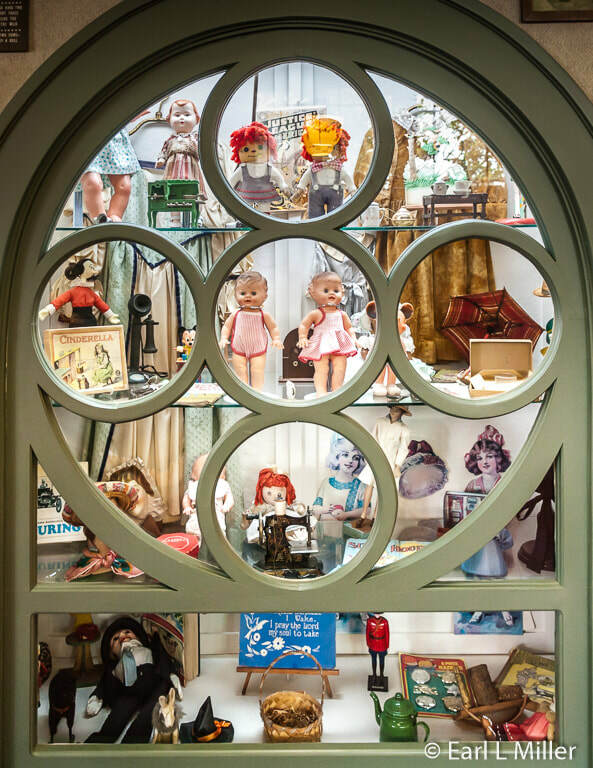 The museum is divided into several rooms where you’ll discover unusual items in corners, on walls, and even on floors. 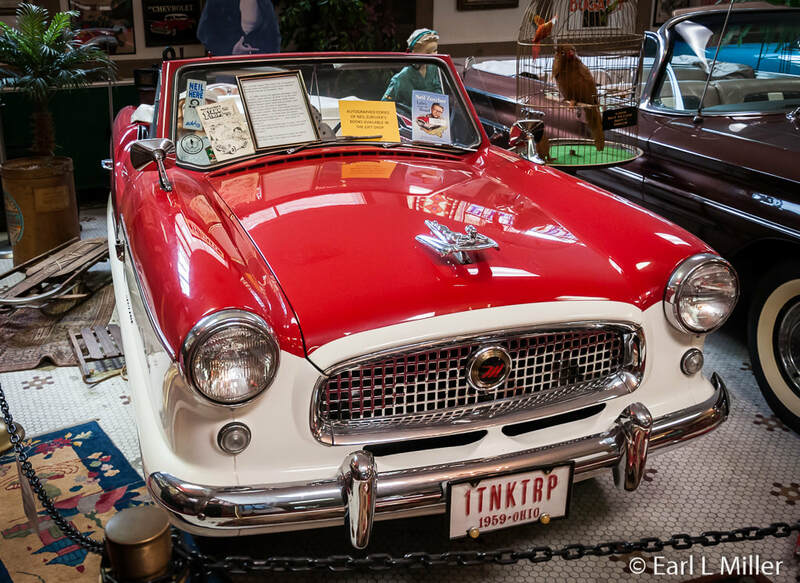 You could say that the Canton Classic Car Museum has something for everyone. Toy lovers will spot Tonka trucks, Hot Wheels, doll carriages, and a dollhouse. Dolls include Raggedy Ann and Andy, Sun rubber dolls, and the Incredible Hulk. Look carefully to find the portrait of President Franklin Delano Roosevelt made on a typewriter by an inmate at the Ohio State Penitentiary in 1941. You'll also discover lots of President William McKinley campaign souvenirs and photos. The Oriental Room, filled with Asian artifacts and Oriental rugs, has as its highlight a litter upon which strong men would carry someone of great importance. You’ll also find lots of Buddhas and Asian dolls. The museum is loaded with vintage advertising. In their Canton room, these represent many of the area’s businesses. Visitors find everything from metal and porcelain advertising signs to boxes, tins, containers, and cans. 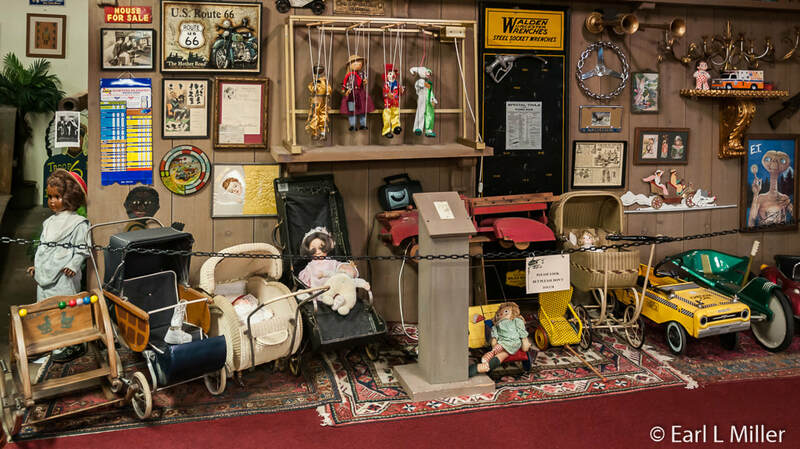 Rare items from Canton’s long gone Meyers Lake Amusement Park are displayed such as the Fortune Teller and the Monkey Band. Others are on the history of the city such as historic plates, photos of various companies in Stark County, and Palace Theater’s opening program dated November 22, 1926. Look for the movie posters scattered around. Automotive items such as a collection of radiator caps and hood ornaments are on display. 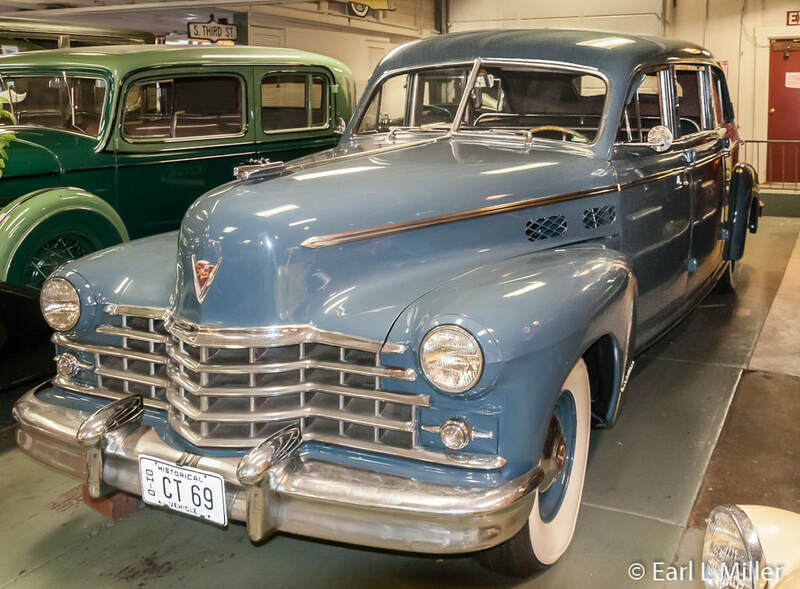 Visitors also find license plates, model cars, chrome model markings from full-sized automobiles, and bricks plus a highway marker from the Lincoln Highway. Pictures of old gas stations are exhibited and brands of gasoline advertised. Photos of celebrities are found everywhere including photos of the Dionne quintuplets at Christmas time and at age four. You’ll also find cardboard cut outs scattered throughout. These include James Dean, Clark Gable, Marilyn Monroe, the Kennedys, Joe DiMaggio, and Roy Rogers. Others are George H.W. and Barbara Bush, George W. Bush, Rapunzel, The Muppets including Miss Piggy, Statler and Waldorf, a very large penguin, and a Loch Ness monster. Fashions have not been forgotten. They have gloves and all types of hats. 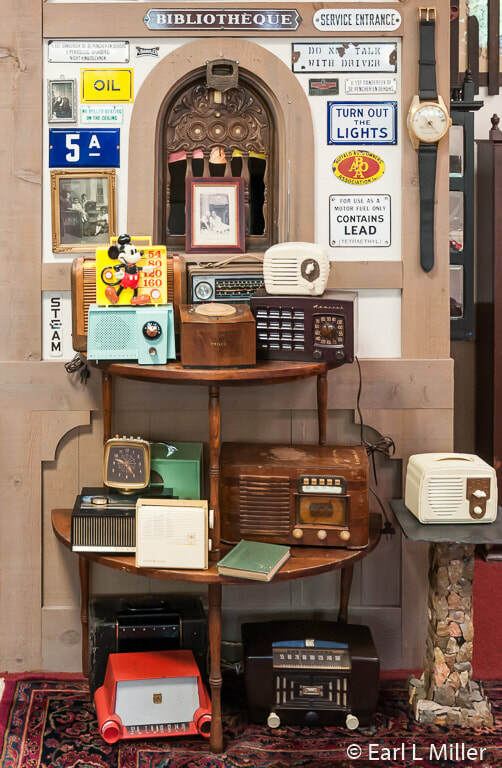 You’ll also find a case of old radios, circus signs, a Hula girl that sways, and Billy the Singing Fish. Youngsters can ride Rudolph, the mechanical reindeer, or they can spend time at the coloring tables. They may also enjoy seeing a sculpture of Nipper, the RCA dog made by Old King Cole Company in Louisville, Ohio. There is a cut out of the moon where people can sit on the moon and one of a car where they can put their heads in and try on different hats. 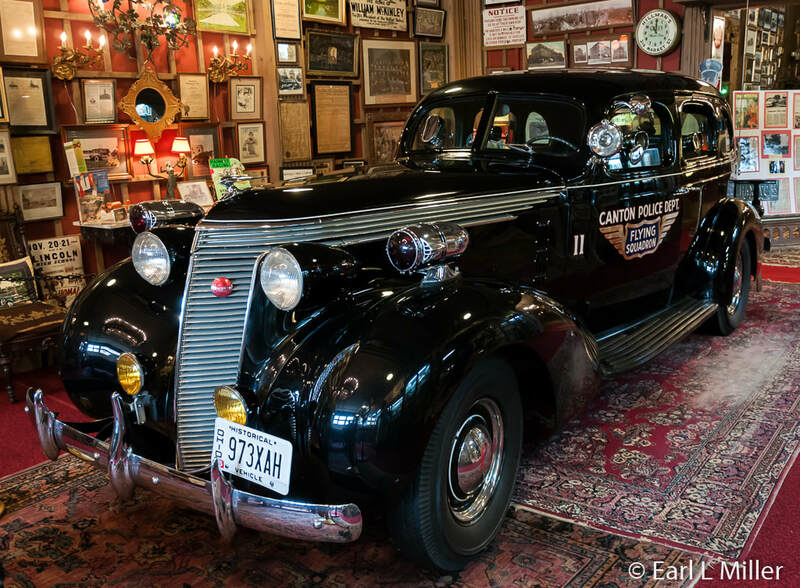 The showpiece of the Canton Room is the 1937 Studebaker President armored police car. It was claimed to be the only fully bullet proof car in the United States. That was later changed to the only bullet proof Studebaker when Al Capone, who frequented Canton for ten years, said his car was more bullet proof. 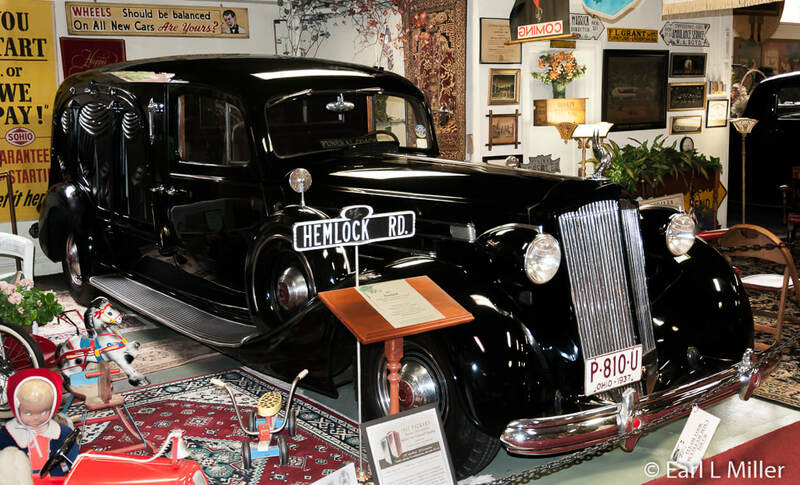 In the 1930's, the car came in handy when Canton was known as “Little Chicago.” Gangsters got in and out of the city quickly because of the Lincoln Highway. The vehicle also helped maintain control at strikes at area mills. This was the only car like this made. Called “The Flying Squadron,” the car has 3,000 pounds of 10-gauge armored plating. Its windows are 1-1/8 inches thick. Each window features a closable Tommy gun porthole.It has bullet resistant inner tubing in its tires. Its weak spot is the gas tank neck. It is three inches long with no armored steel. It had two Motorola two-way radios to converse back and forth. Air flow consisted of a tiny fan above the dashboard. It was in service for 50 years without a breakdown. It had a full arsenal of tear gas guns, two 25-caliber rifles, two 12-gauge riot guns, and a .45 caliber Thompson submachine gun. It was last used in a 1957 robbery at Fair Hope, Ohio. Three men took a family hostage in the family’s basement. When the police started shooting tear gas, the men gave up. Check out the Benham. It was the only one built in 1914. The company made 19 in total that year and this is the last one known to exist. It is a six-cylinder car with a three-speed transmission. Each of the engine’s cups has to be individually primed and cranked. 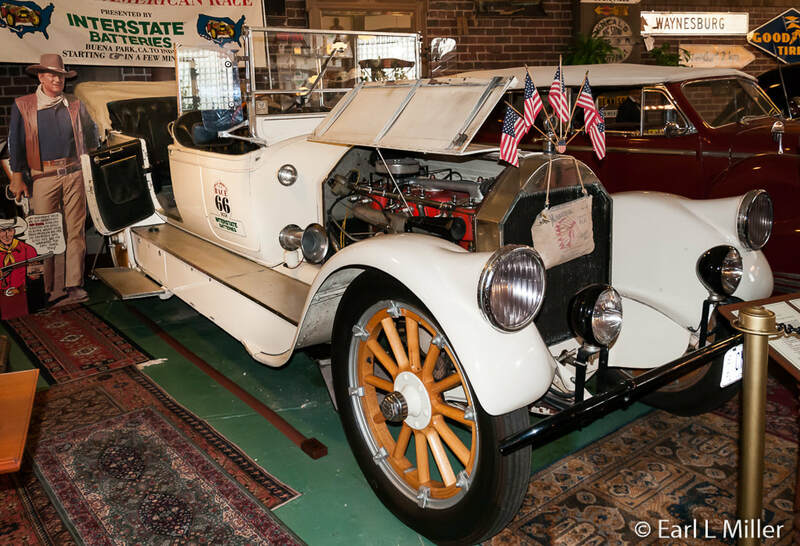 Built between 1914 and 1917, Benham made approximately 60 cars in Detroit. Benham made dashboards for Henry Ford upon Ford’s request. When Ford turned down his work, Benham made his own cars until he passed away and the company went into receivership. This car sat outside for 25 years and then was put in a garage that caught on fire. It survived. Char showed us two of her favorites, both 1937 Packards. One carried flowers while the other was a hearse. 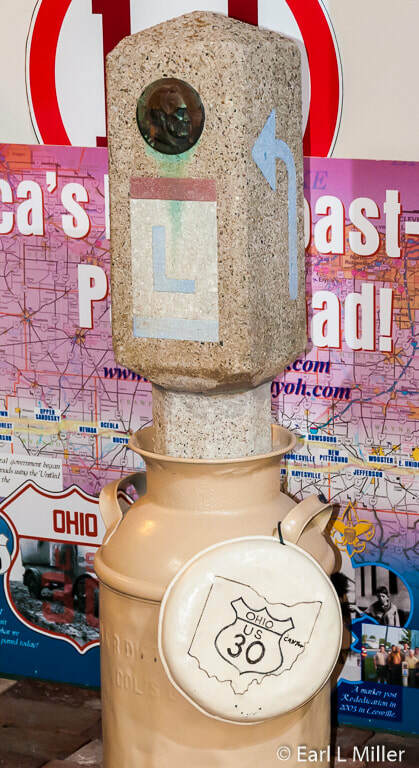 Both were made in Detroit, Michigan; customized in Bellefontaine, Ohio; and used by the Fisher Funeral Home in Vermilion, Ohio until the mid 1950's. They were leased to other funeral homes. The two cars have never had separate owners. The flower car is an 8-cylinder vehicle while the hearse is a 12-cylinder. The flower car looks much like a 1930's version of an El Camino as its back is a cutaway. They only made three of the 12-cylinder version. This is the last one left. With its hand carved, mahogany body panels that resemble curtains on the exterior, Char calls it a “Work of Art.” Open its door, and you’ll definitely hear a prolonged creeeeak that reminds you of the Adams family. The cars sit behind the sign for Hemlock Road and near the “Dead End” sign. The 1916 Simplex Crane limousine, Crane Model #15, came from Long Island City, New York. On display is the original car which has never been painted, rebuilt or altered. Originally, it had a microphone in the back seat and a wooden body. There are 28 known remaining Simplexes. George Monnet was responsible for a Hydro car in 1917. He debuted it in Canton in Myers Lake and took it to Washington, D.C. to show it off in the Potomac River. He had hoped that it would be used in World War I. However, the government informed him that the war would probably be ending so the Hydro car never went into production. However, the museum does have on display a very unusual car. 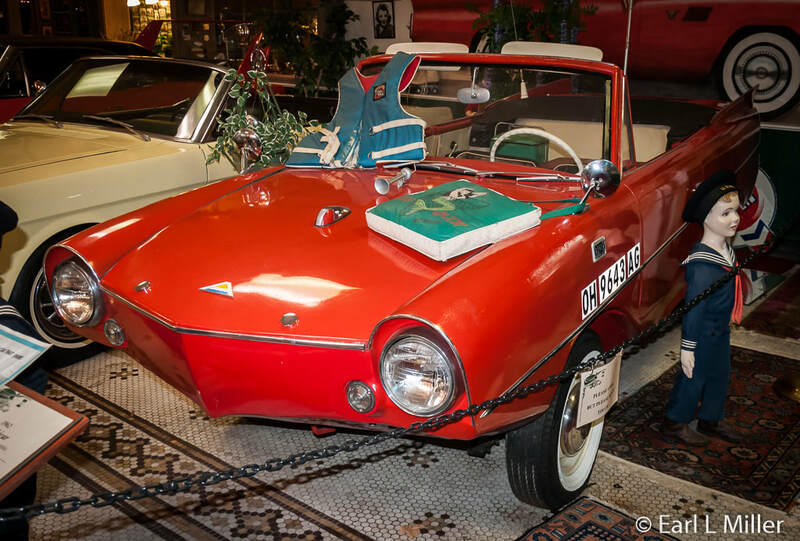 It’s the red 1962 German-built Amphicar which could be driven into a lake and used as a pleasure boat. This four-cylinder vehicle goes 8-9 MPH on the water and 25 MPH on land. On the road, consumption is 32 miles per gallon while on the water, it takes 1-1/2 gallons per hour cruising. The fuel tanks holds 13 gallons. The rear of the car is fitted with dual propellers. When submerged, the front wheels acted as dual rudders. 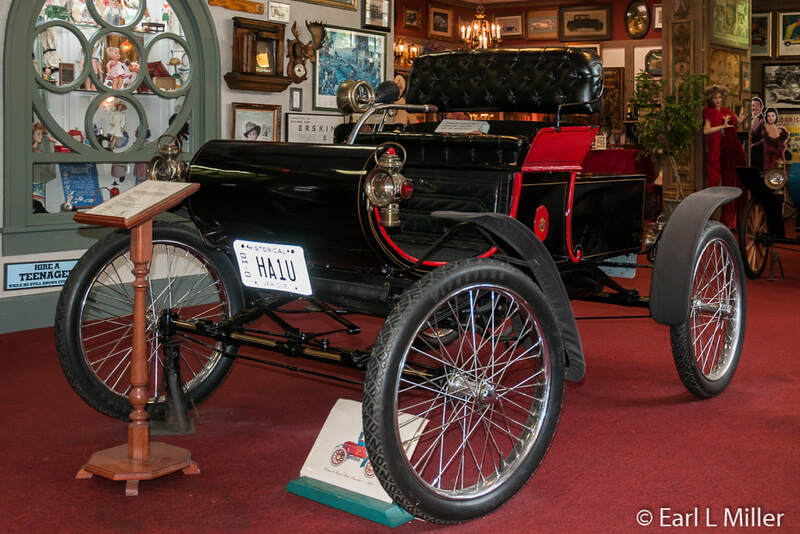 The oldest car on display is the black 1901 Curved Dash Oldsmobile. The car has a single-cylinder and was one of America’s most popular early vehicles. Oldsmobile built 425 of these in 1901. The car was available with wire or wooden wheels. It has a right hand drive and tiller type steering. This car still runs. It sold for $1 a pound. Since it weighed 650 pounds the car cost $650 with the option of a top which cost an additional $50. Ransom Olds was responsible for the basic concept of the modern assembly line. He used it to build the first mass-produced gasoline automobile in the world. He was born in Geneva-on-the Lake, Ohio but later moved to Lansing, Michigan where he founded the Oldsmobile Company. He left that corporation in 1905 to start REO Motor Car Company which built REOs from 1905 to 1975. One with a Canton connection is the 1904 St. Louis Motor Carriage owned by Henry Timken. George Dorris did not succeed with the Dorris automobile at the Dorris Automobile Company and became the vice president and chief engineer of the St. Louis Carriage Company. His car, originally made from wood, was manufactured in St. Louis, Missouri. The car exhibited is one of eight known to exist. Henry Timken, who started in Missouri as a carriage maker, aspired to be the premier supplier of roller bearings to the auto industry. He sold three sets of axles featuring his newly patented tapered roller bearings to Dorris. 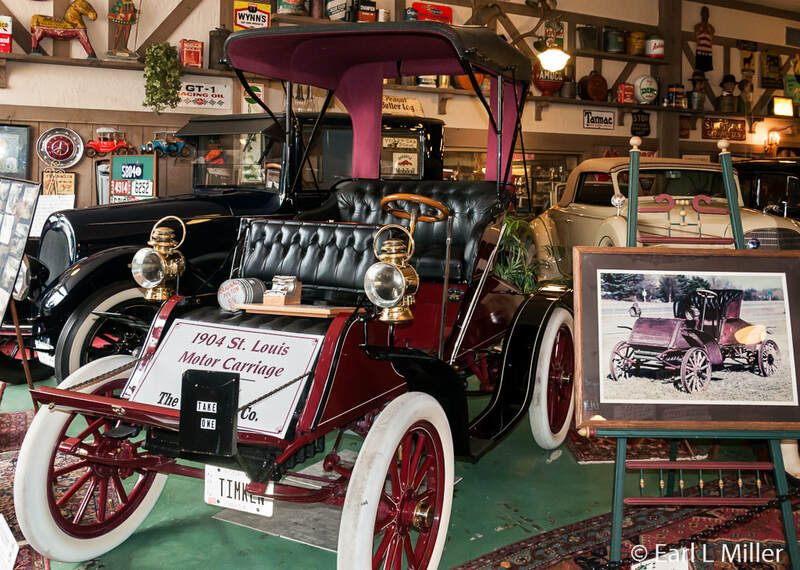 Between 1899 and 1905, Doris’s factory produced 350 cars, and by 1903 Timken axles and roller bearings were standard equipment on St. Louis vehicles. In 1901, Timken relocated from Missouri to Canton, Ohio. The bearings patented in 1904 were patented again in 2004 since the original one was only valid for 100 years. It’s the same as the unipac the company uses today. The Case Company was founded in 1843 in Racine, Wisconsin as J. J. Case Threshing Machine Company. It built steam engines in 1869. The company made the first gasoline powered tractor in 1904 and started manufacturing automobiles in 1911. It was known for well built, medium priced, four- cylinder cars through the teens. 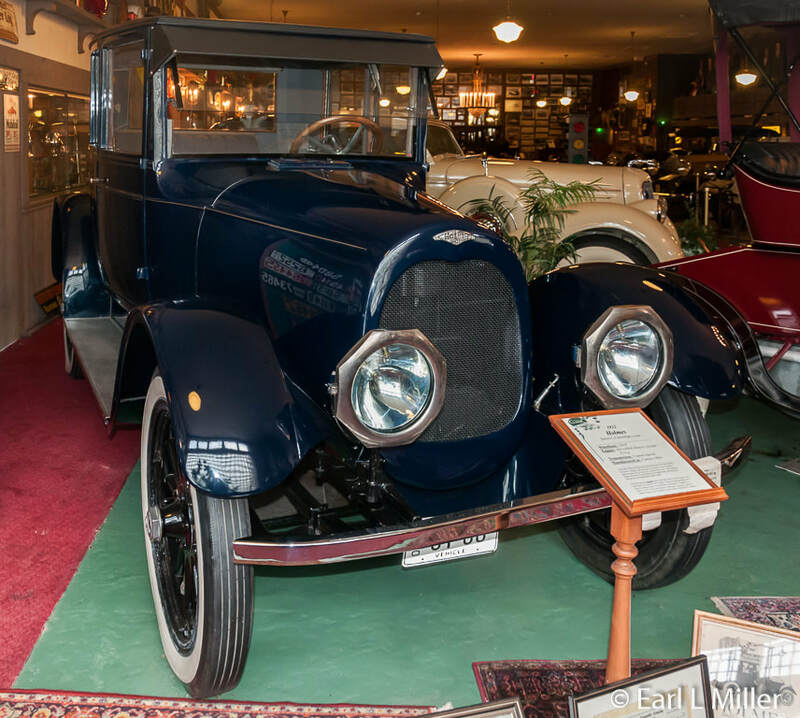 The 1914 Case on display was owned by John M. Dorton, an upholstery salesman, who invented its headlights called Human Eye auto lamps. These could be steered with the car or placed under manual control. This enabled them to be pointed the way the driver wished. He installed these on his car along with a combination cushion that moved to soften road shocks. Dorton installed a calliope, using compressed air, to announced his presence when he entered a town. It operated on exhaust gases which resonated through organ pipes. 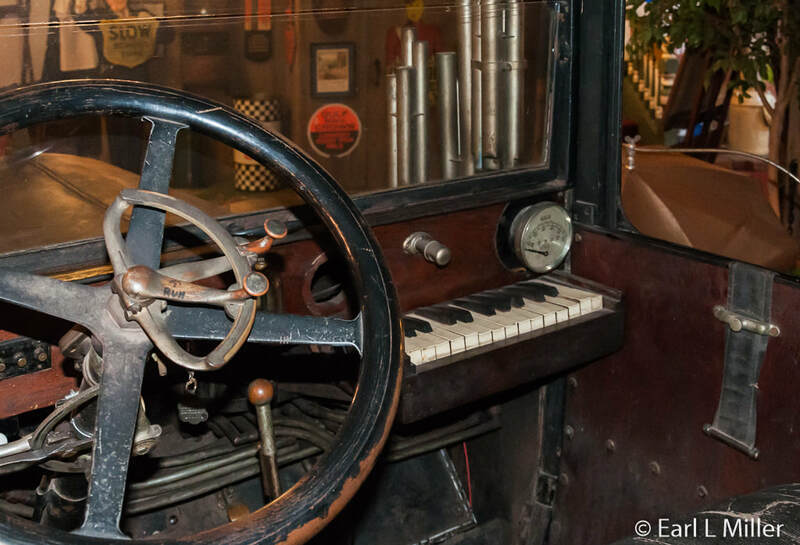 He installed a keyboard on the dashboard’s right side so that he could play any tune. It also has courtesy lights, valance lights that illuminated the running board, signs on the car’s sides, and a luggage rack on the roof. The car has electrically heated, adjustable seats. Look for the 1915 Model T which came in eight body styles. Its entire engine and transmission are cast in a solid block. Ford introduced the steering wheel on the left which other companies copied. Ford made more models than T’s such as P, Q, R, S, N, and O. People remember that Ford said you can have any color in a car as long as it’s black. However, the company made cars in a variety of colors before 1914. 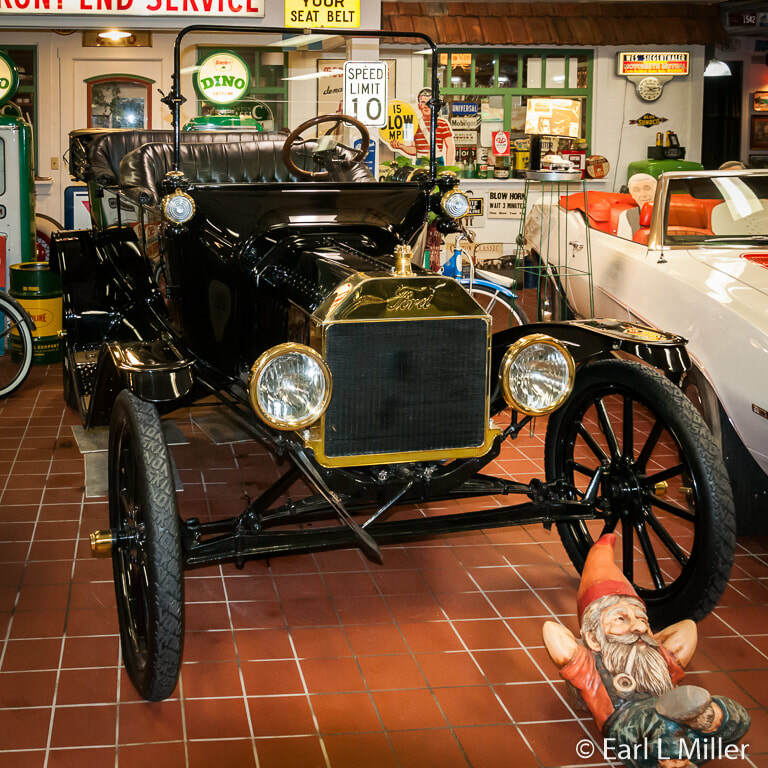 The museum also has a 1913 Ford Model L Huckster on display. The 1916 Pierce Arrow had the largest engine in passenger cars of its time. It had an 825 cubic inch displacement. This model was in production until 1918. Pierce Arrow was among the first automobile manufacturer to use aluminum panels in their bodies. Pierce Arrow cars were manufactured in Buffalo, New York from 1901 to 1938. They were revered for their luxury. Between 1909 and 1935, the only vehicles used for Presidential functions were Pierce Arrows. President Wilson used Pierce Arrows from 1913 to 1921. He was the first president to join AAA, whose symbol he proudly displayed on his car. The company was known for such household items as gilded bird cages. They also made commercial trucks, fire trucks, camping trailers, motorcycles, and bicycles. 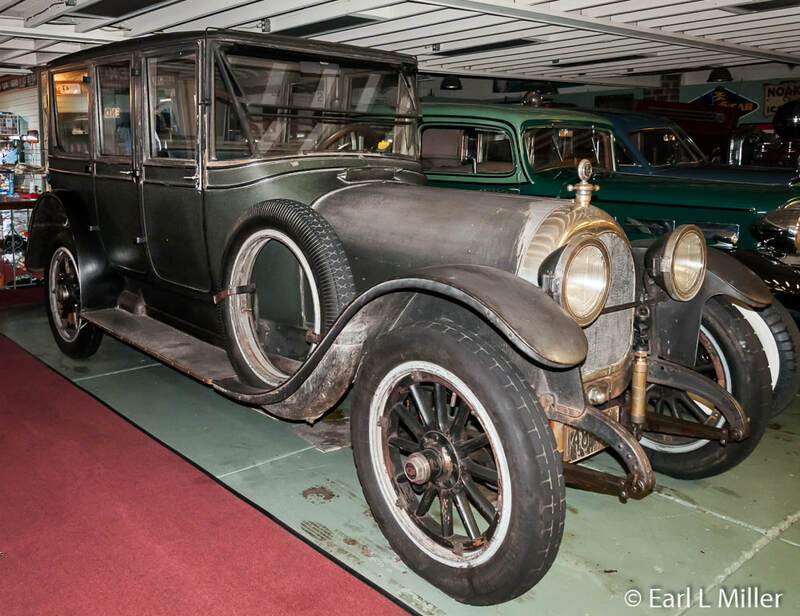 In 1928, Studebaker bought Pierce Arrow. When Studebaker declared bankruptcy in 1933, they sold Pierce Arrow to a group of Buffalo businessmen. They sold the cars to 1938 and parts to 1942. The remaining parts were melted down for the war effort. Canton had seven different automobile manufacturers at one time. On display is a 1922 Holmes. It was billed as the world’s most comfortable car and also the world’s ugliest car. It was the world’s only full sized, air-cooled engine car and had a rear seat heater. Arthur Holmes’ built his own air-cooled engine cars in northeast Canton. It had overhead valves and vertical fins. Although the company sold 500 a year between 1918 and 1923, it went out of business in May 1923 after its vice president was charged with embezzlement. Only two Holmes exist today of which this is one. 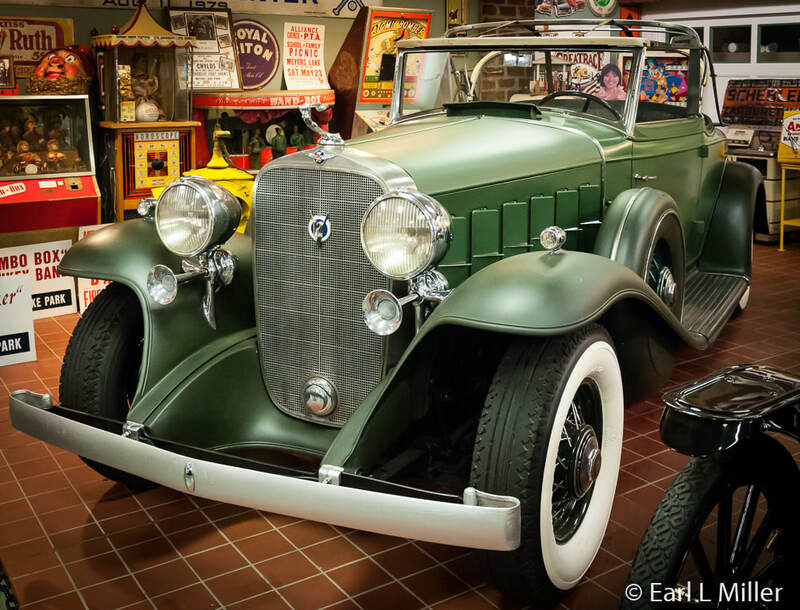 The 1931 Marmon on exhibit was made in Indianapolis, Indiana. It was a very innovative company. They started work on the world’s first V-16 engine in 1927 making 390 16-cylinder automobiles between 1931 and 1933. However, Cadillac started producing V-16 engines a few months earlier than Marmons. They pioneered the use of aluminum in cars and were touted as “The World’s Most Advanced Auto Car.” Each car came with a certificate that it had been tested at the Indianapolis 500 Speedway. Marmon also designed the first mounted rear view mirror in the world in 1911. Its six-cylinder Wasp, in 1911, won the first Indianapolis Speedway Race. It was driven by Ray Harroun. All the other cars carried an extra person as a spotter instead of having the rear view mirror. 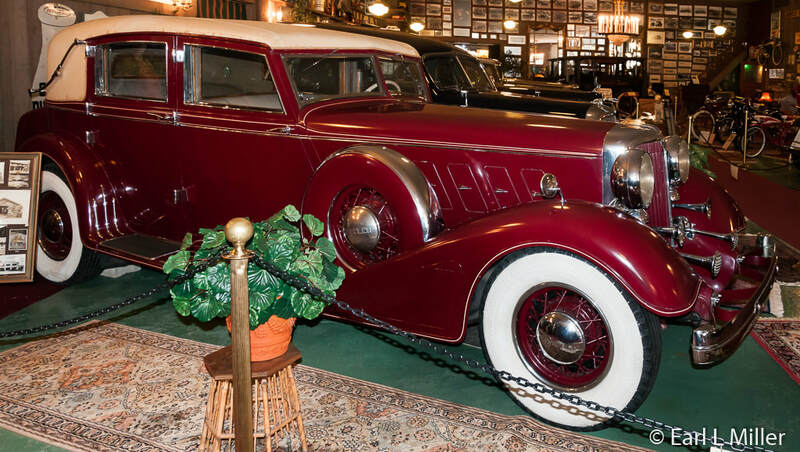 Walter P. Chrysler’s personal car, a 1932 Chrysler Imperial, is on display. It had a full dash in back including a speedometer. 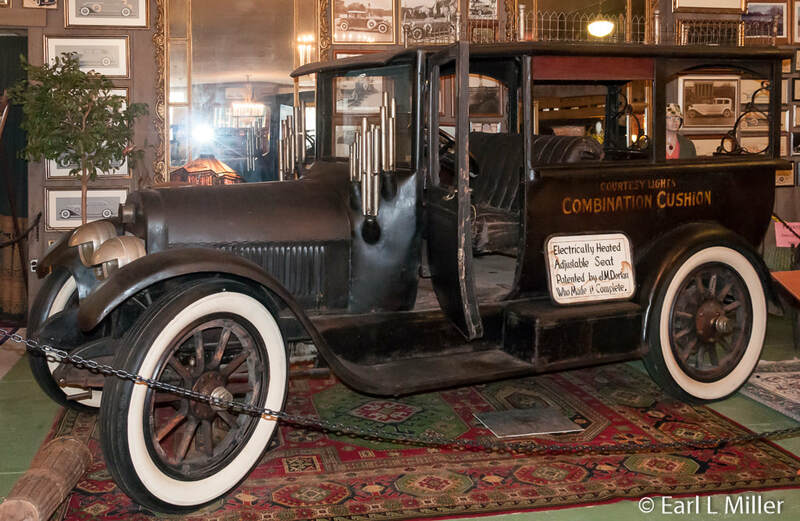 It is on loan from the Henry Ford Museum at Dearborn, Michigan. The one on exhibit is the first vehicle for the handicapped in the United States. It belonged to a Colorado rancher who owned thousands of acres of land. Its center post drops to the ground. In the trunk are a set of ramps that can be taken out and secured. In place of the back seat is space for a wheelchair. Only three of these were built and it’s rumored that President Roosevelt may have owned one. 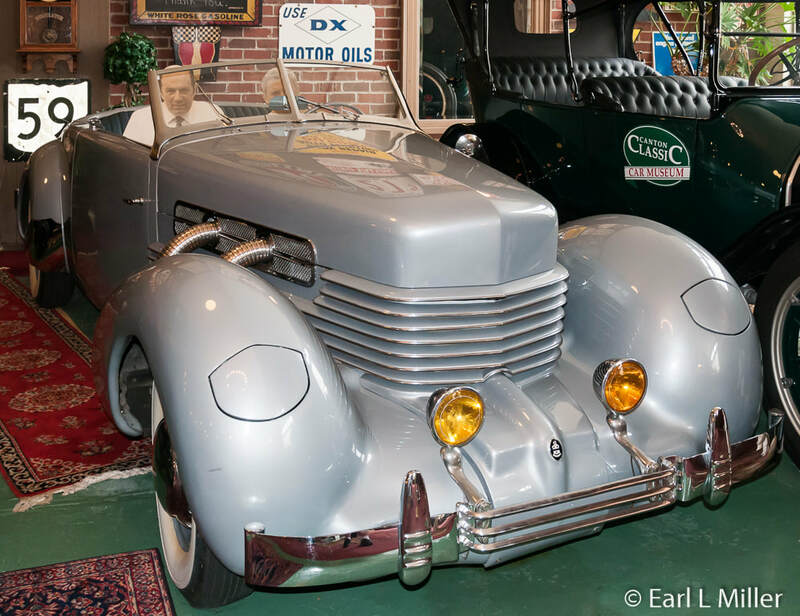 A 1937 812 Supercharged, Cord Phaeton convertible is on display. It was dubbed “The Baby Duesenberg” and was considered to be a car ahead of its time. It has a coffin grill, hideaway headlights, and the first front wheel drive. It was the first automobile with no running board as it was built lower to the ground. When it debuted in 1936, it caused quite a stir. Assembly line glitches and financial problems led to the Cord’s end with the last one pulled off the line on August 7, 1937. 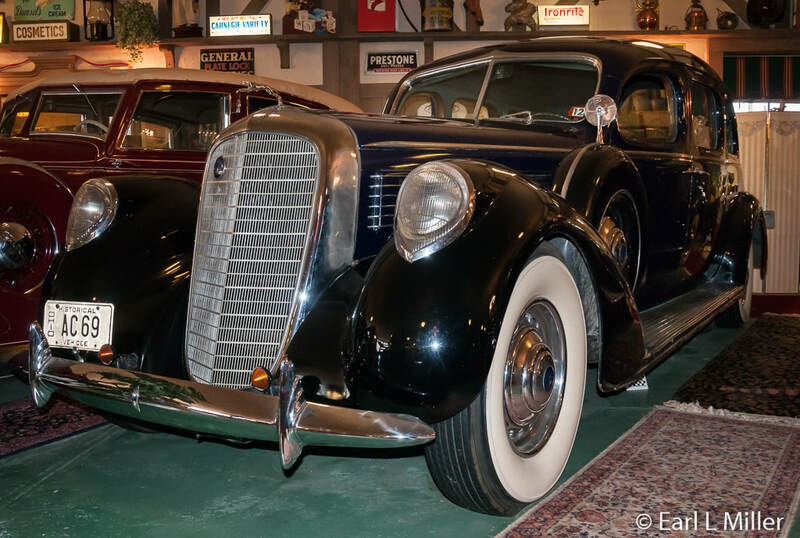 Cord had been the holding company for more than 140 other companies including Checker Cab, Duesenberg Inc., and American Airways (later American Airlines.) They were manufactured in Connersville, Indiana. The 1939 black Lincoln was designed for Queen Elizabeth, the Queen Mother. She rode in it during a Canadian tour. The vehicle has a high dome. To make sure that her highest plumed (feathered) hat would fit, they had her sit down and measured her hat. The car was built around it so that she would look presentable while she was riding. The 1947 Cadillac, a 12-passenger limo, was custom manufactured by Cadillac. It was used by the Broadmoor Hotel in Colorado Springs for several years to take passengers to the top of Pikes Peak. The limo was part of their Gray Line fleet. A 1959 Cadillac is also displayed. An unusual one is the 1957 BMW Isetta. The company originally built 300 of these on a triangular chassis. It was able to get 63 miles per gallon and had a top speed of 53 m.p.h.. 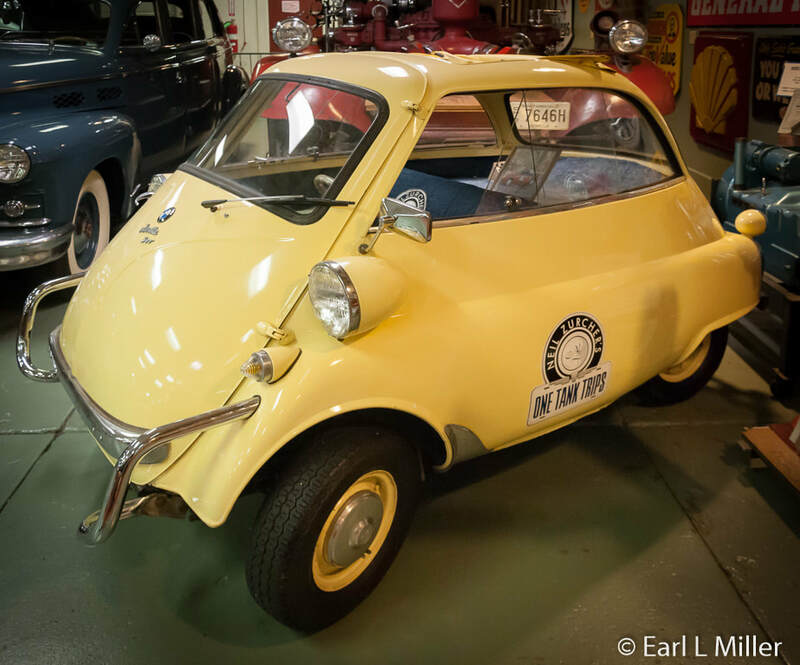 It was one of the most successful micro cars produced in post World War II years. All had four wheels including two rear wheels although a British 1958 model had a single rear wheel. They were equipped with a single swing open door in the front. The steering wheel moved with the door. All had an open top that could be used as an escape hatch. Elvis sent one of these to Colonel Tom Parker, his manager, as a Christmas gift. Zurcher’s 1959 Metropolitan Series IV convertible, also used during the televion segments, is a four-cylinder car. The Metropolitan was introduced by AMC and that same year put under the Hudson name. All Metropolitans were one color until the 1956 model year when the two tone became popular. Others displayed from this period are a 1936 Lincoln Model K, a 1936 Lincoln K Willoughby, and a 1938 Cadillac. You’ll also see a 1937 Packard 15th Series which was a convertible sedan and a 1932 Cadillac 370-B with a Fisher body. The Mustang was first introduced April 17, 1964 at the New York World’s Fair. On the first day, Ford sold 22,000 of these and more than one million in 18 months. Though it was first named after the P-51 Mustang fighter plane, the idea was rejected because it was too “airplaney.” It was thought that to name it after a horse would be more romantic so that motif quickly became the emblem for the Mustang. You’ll find a 1966 Mustang four passenger convertible displayed at the museum. 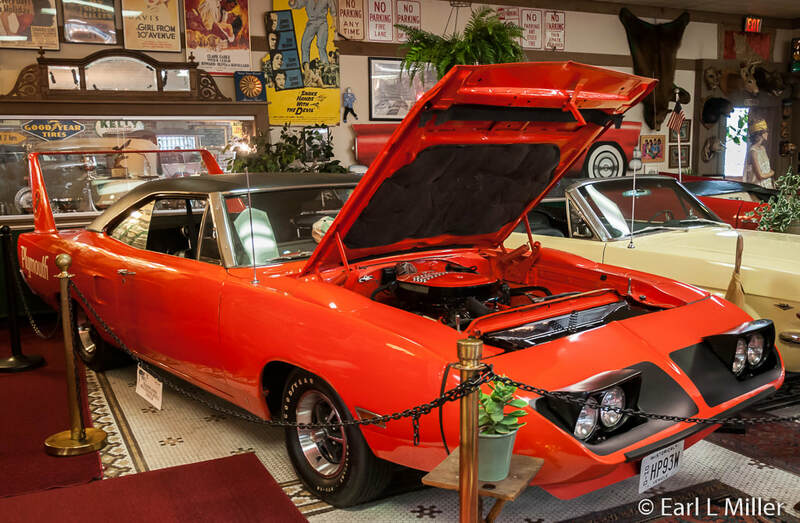 The orange 1970 Plymouth Road Runner Super Bird was designed and built to lure Richard Petty back to Plymouth on the NASCAR circuit. Petty had left the Plymouth racing stables and gone to Ford because he felt he wasn’t given a competitive car. They told him they would aerodynamically design a car for him. They put a spoiler on. It was flat on top and curved underneath to be aerodynamic. They used fender scoops to eliminate captured air in the wheel wells. Front fenders and the hood were copied from the Dodge Coronet because they were streamlined. They built 1,920 of these (one for every two Plymouth dealerships) in two different engine types: a 446 6-barrel and a Hemi. All production models came with vinyl tops. They came with two jacks - a standard bumper jack and a scissors jack. These were among the first automobiles to use tunnel testing and computer diagnosis for improved aerodynamics. Other newer cars that are exhibited are a 1968 Bonneville, Pontiac; a 1966 Mustang; and a 1969 Camaro pace car. On display is a 1937 Ahrens Fox Quad fire engine. It has a Hercules engine and a giant, chromed, pressure equalization dome up front. It pumped 100 gallons per minute. It was one of three purchased by the Canton Fire Department. Museum visitors will also see several motorcycles. One is a 1911 Indian motorcycle. That company was started by a bicyclist/engineer in Springfield, Massachusetts at Hendee Manufacturing Company. The museum also has a 1921 Harley Davidson, a Volkswagen motorcycle, and a Cleveland motorcycle. Besides being director of the museum, Char gives a fantastic tour. Her knowledge of cars is extensive and her personality is charming and enthusiastic. She has been enthralled with cars since she was little. In fact, her two sons were named after cars. One is named Cole and the other Chase. Coles came from Indianapolis while Chases were made in Syracuse. The museum is open daily, except for major holidays, from 10:00 a.m. to 5:00 p.m. It is located at 123 6th Street S.W. in Canton and their telephone number is (330) 455-3603. Admission is $7.50 for adults (ages 18 and up); Seniors (60 and up) $6; youth (5-17) $5; and children (4 and under) $3. There is a well-supplied gift shop in the museum. Patrons will find free parking. NOTE: To be notified when new articles are posted, fill out the request form on the Contact Page. It’s a free service.